Along with being a safe fuel to use, gas is also efficient and affordable. 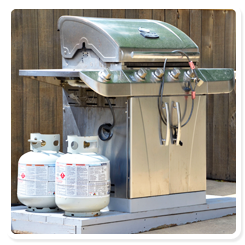 Upgrade your home with energy-efficient outdoor grills and tankless water heater sales and installations from Wright's Gas Company. We also have a first-class selection of outdoor kitchens to help expand your entertaining options at home. cook food better than other grills and are easier to use. Holland grills are available in different sizes and feature different accessories like sear mates and smokers. Liberty­™ and Freedom™ are our most popular models from Holland. To help you cook while you're camping, we also carry portable grills. Please call for grill price ranges. All grills come with either a three-year or 15-year limited lifetime warranty. Because our products are guaranteed, we offer no returns, but we will exchange defective equipment. It's easy to cook for family and friends on your patio when you have an outdoor kitchen from Holland, Blaze™, FireMagic™, American Outdoor Grill™, or Napoleon™. They come in a wide variety of styles and sizes, and they offer multiple outdoor kitchen accessories. The Blaze brand is our most popular outdoor kitchen, because it provides great quality for a great price. Call for pricing information. The hot water you want is always available when you outfit your home with tankless water heaters from Noritz™ and Rinnai™. These efficient products are the number-one selling water heaters in the United States. Although Rinnai is our most popular seller, you won't go wrong with any of our water heaters. Because our products are guaranteed, we offer no returns, but we will exchange defective equipment.